We are in the first quarter of 2018 and deal data is now available through the end of the fourth quarter. In this report, we review our region’s most active industry sectors and give an outlook for 2018. The outlook for 2018 aerospace M&A is strong: increased liquidity from tax reform, the current administration’s push for greater defense spending and the geopolitical environment are among the tailwinds supporting the sector. 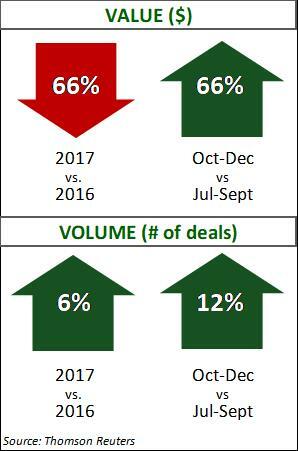 The sector experienced a record year in 2017 with deal value 7% higher than the previous record year of 2015. One of the year’s largest mega deals (United Technologies’ acquiring Rockwell Collins) announced in Q3 accounts for the drop in value for quarter over quarter. Aircraft and Parts category maintains the largest share of deal value as part suppliers seek to protect profit margins and core capabilities from increasing competition. The Defense Arms and Vehicles category doubled its deal value in 2017 with the change in geopolitical tensions. The US may increasingly become a preferred location for chemical deal activity with US tax reform, a weakening dollar, and increasing oil prices. Several mega deals from 2016 were a focus of integration efforts in 2017, pausing some M&A activity. To eliminate potential regulatory concerns with the Bayer-Monsanto megadeal, Bayer decided to sell its crop science business to BASF, accounting for the sector’s only mega deal announced this quarter. Similar divestitures may be necessary in 2018 to complete these large deals. Specialty Chemicals accounted for around half of deal volume and value as the category’s companies consolidate to find increased market share through synergies and reduced operating costs. The outlook for 2018 in construction and engineering is positive, fueled by a stronger economy, government deregulation, tax reform, and the opportunity of a new infrastructure bill. 2017 ended with a strong upswing in deal value, supported by a strong global economy and focus on infrastructure. One mega deal was announced in October, the Lennar merger with CalAtlantic, resulting in the largest home builder in the US. Merger objectives are to capitalize on synergies while eliminating duplicate overhead and public company expense. The US Census Bureau reported that 2017 annual construction spending increased 4% from the previous year, which is a solid platform for 2018 growth. Rising oil prices and U.S. oil production levels have been a strong tailwind for the energy sector in the past quarter. While the sector faces many complex events with the passage of the Tax Cut and Jobs Act, the reduction in the federal corporate tax rate to 21% and the influx of repatriated cash are expected to increase deal activity in 2018. Fourth quarter surpassed the previous quarter, but results were still soft. This year, companies seemed to move towards right-sizing and portfolio rationalization with smaller deals and non-core asset sales. Upstream claimed 51% of deal volume this quarter, but 24% of deal value. Midstream deal volume increased 60% over the third quarter and accounted for 38% of deal value. The fourth quarter had another 28 shale deals, adding to the highest number of shale deals in history. Improved production techniques and new rigs have increased interest in this sub-sector. While uncertainty remains with the future of the Affordable Care Act, tax reform, low interest rates, and the possible repatriation of overseas funds will likely lead to increased funding for all healthcare deals in the year ahead. The sector’s largest deal in 2017, CVS acquiring Aetna, was announced during Q4. However, even excluding this transaction, deal value still would have been nearly 40% higher than 2016. 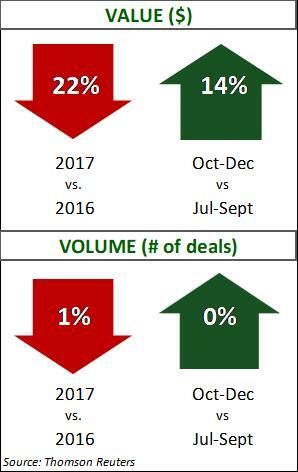 Healthcare M&A deal volume has surpassed 200+ deals for 13 straight quarters. Analysts anticipate this trend will continue. 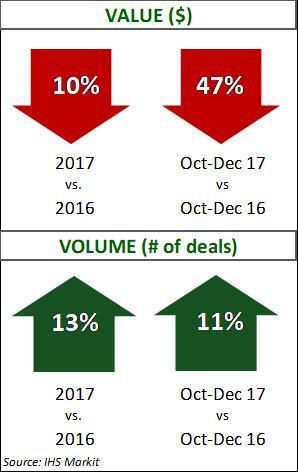 Managed Care accounted for the greatest percentage (81%) of Q4 deal value thanks to the CVS/Aetna mega deal, while Long Term Care continued to drive deal volume with 31%. Managed Care was also the fastest growing category in terms of value and volume. With an increasing number of drugs being approved by the FDA, analysts believe M&A activity could result from market overcrowding. Many of the headwinds the industry faced have dissipated and industry analysts are optimistic about the upcoming year, citing a projected GDP expansion and tax reform. 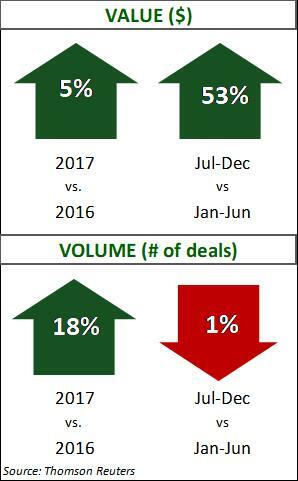 Compared to the prior year, 2017 sustained a steady M&A market, with deal volume and value flat with the exclusion of the JCI/Tyco mega deal in 2016. 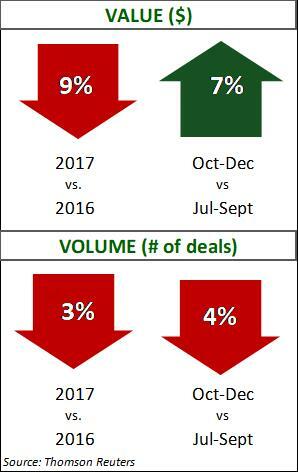 While deal volume remained unchanged year over year, the sector maintained a healthy number of deals transacted. The Industrial Machinery category accounted for eight of the top ten deals value in 2017. The continued need for digital innovation continues to be relevant and will also drive strategic M&A activity. In Q4, 2017, all sectors in the transportation sector, except for rail, posted higher deal value and volume. 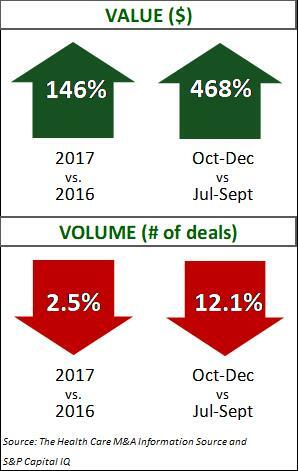 Strategic investors led deal activity in the sector; however, financial investor volume activity increased 25%, mostly focused on the middle and lower market. 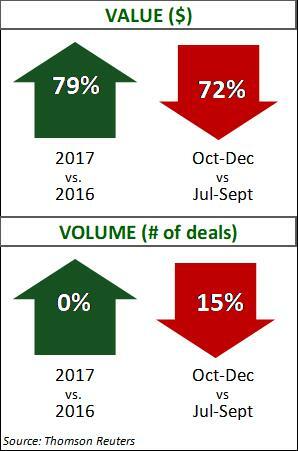 Passenger Air and Passenger Ground owned six of the ten largest deals; Shipping and Logistics both drove deal volume with more than 30% more deals this year over last. For 2018, M&A activity in the Shipping category should increase as companies seek new capabilities to meet the rising demand of E-commerce. Clients trust ClearRidge to deliver a confidential and discrete preparation and sale process, to remove obstacles to close a transaction and ensure only the most qualified prospective buyers make it to the closing table, with the capital and commitment to close a transaction. The ultimate goal is a higher sale price and preferred deal terms.